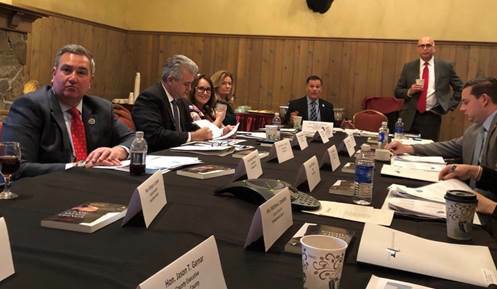 The County Executives Association meets to discuss issues including recreational marijuana legalization, during the NYSAC conference in Albany. Chautauqua County Executive George Borrello is pictured far left. ALBANY – New York’s Democratic lawmakers and Gov. Andrew Cuomo may not be able to hammer out a deal on legalizing adult-use marijuana in the next two months, according to Assembly Speaker Carl Heastie. A report from the Albany Times Union says on Thursday the speaker discounted the possibility of legislative leaders agreeing to a framework for legalization in the budget that is due on March 31. The comment generated disappointment from some advocates, who are hoping the issue can be tackled during the budget process. Meanwhile Chautauqua County Executive George Borrello presented his open letter regarding marijuana legalization to Governor Andrew Cuomo at the New York State Association of Counties (NYSAC) conference in Albany earlier this week. The letter (provided below in its entirety) was discussed during the New York State County Executives Association meeting and Borrello was told it would be passed on to the governor and other state leaders as part of the information used to help craft any potential legalization legislation. 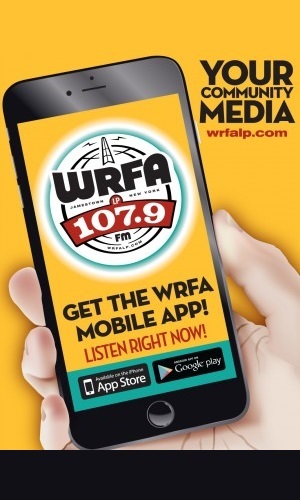 Last month Borrello was a guest on WRFA and we asked him about his thoughts on legalization. He said he had concerns related to both public health and public safety. Mental health advocates this week also raised their own concerns about recreational marijuana. The Mental Health Association of New York State cited concerns about potential addiction and whether marijuana use can interfere with neurological development in young people. Gov. Cuomo has estimated marijuana legalization could eventually generate more than $300 million in tax revenue. A recent poll also found that while a large majority of New Yorkers support recreational use of marijuana, they don’t all have an interest in trying it. The purpose of this letter is to share my thoughts not only as a countywide elected official but also as a local businessperson on important steps and concerns I believe you and the state legislature should consider as you move forward with the legalization of recreational marijuana. Although I personally oppose it, I realize that it appears to be inevitable and I want to prepare our county for it. I consider us to be fortunate to have our state legislators, Assemblyman Andy Goodell and Senator Cathy Young, working for us. In addition to being champions for Chautauqua County in Albany, they have always been strong voices for common sense in state government. They have already outlined many of my concerns over the potential negative impacts and unintended consequences of legalized recreational marijuana and the actions that should be taken to protect our children, families and communities from the unrestricted use of marijuana. Senator Young and Assemblyman Goodell have outlined a thorough list of concerns. My list of concerns below, which I have shared with them is more focused on the potential impact on local businesses and communities.Please note that I am avoiding directly duplicating issues already being addressed in our legislators’ list of regulatory concerns. Overall, recreational marijuana should be controlled in a similar manner as alcohol in New York. Not just as it pertains to its sale but also how, when and where it can be consumed. Marijuana consumption should have its own “open container” law. It is unlawful in New York to consume alcohol on the street or in any other public setting outside a licensed establishment. The same rules should apply to recreational marijuana in any form for the same reasons. Consuming marijuana in any establishment with a liquor license should be illegal. In New York, licensed establishments are liable for their patrons’ responsible consumption of alcohol. Therefore, patrons are not allowed to consume alcoholic beverages on the premises of a licensed establishment that were not purchased from that establishment. Allowing marijuana to be brought into and consumed on the premises of a licensed operation will create an undue burden on those operators to control their patrons level of intoxication and the ability to ensure only those patrons over 21 are consuming it. It will create unnecessary additional liability and costs for those businesses. Selling marijuana-laced food products should not be permitted. The state should be very concerned for children consuming food products containing marijuana. Selling food products like brownies, gummy bears and other kid-friendly foods that contain marijuana will undoubtedly entice minors to try these products. This is a public health concern and a concern for enforcement of laws and rules that prohibit the use of marijuana in certain settings. Imagine trying to police a public event or public venue where literally any food product could potentially contain a legal yet undetectable intoxicating substance. The cost of training police officers will be significant to our county. Currently we only have four police officers in the entire county trained and certified to identify people operating motor vehicles under the influence of marijuana so the cost to Chautauqua County will be significant. Some may argue that state laws restricting the use of marijuana in public places is not necessary and that operators should set their own rules and enforce them. I believe that will create burdens on businesses that will have to police their operation as well as be concerned with neighboring businesses and public areas. For example, in an entertainment district that has multiple bars, restaurants and clubs, having some establishments allowing marijuana consumption with no restriction on its use in public, will create added liability and cause problems for the places that choose not to allow it. It would be the equivalent of removing the restrictions on the public consumption of alcohol. Our communities and businesses are already heavily burdened here in New York. Adding legalized marijuana into the mix will add to that burden and, in my opinion, the potential revenue will not cover the cost to our communities. If this legalization is poorly thought out and rushed through the process we will pay a heavy price both economically and socially. Governor, I am asking for your help in advocating for common sense rules and regulations so New York can avoid mistakes made by others and can minimize the cost to our communities.